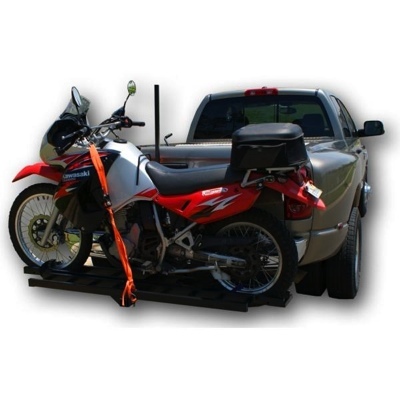 Would you like to haul your motocross motorcycle but do not need the headaches of pulling a trailer? This carrier will help pay for itself in the fuel you will save alone by not having to pull a heavy trailer! The 600lb motorcycle carrier is just what you are looking for to ease transporting your motorcycle. Though not shown , this is the perfect carrier for sport bikes. This motorcycle carrier is designed for bikes with up to 5 1/2 Inch wide tires. The carrier measures 75 Inch and can handle larger sized motorcycles. Black coated steel construction - 67 lbs. This motorcycle carrier also includes a lightweight steel loading ramp for loading your cycle onto the carrier and it conveniently attaches onto the carrier next to the carrier track for transport. This motorcycle hitch carrier has a maximum carrying capacity of 600 lbs. This carrier comes standard to fit in a 2 Inch square class III, trailer hitch receiver. The anti-tilt trailer hitch locking device prevents the carrier from rocking. This unit works great for RV, campers, pick up trucks, vans and SUV. Load your cycle from the left or right (photo shows right mount). Assembles in minutes. The hitch tube is constructed of steel with a durable black coating. The main hitch tube is 18 Inch long from center of hitch pin to center of ramp.